Dr. Bostrom: Delivering babies and blankets! 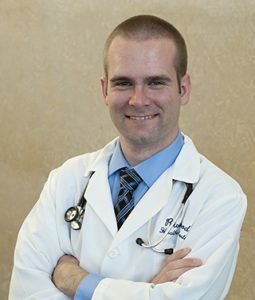 Our family medicine physician, Erik Bostrom, MD, enjoys delivering babies. Now he’s also known for delivering something else—a personalized blanket for every newborn he helps to bring into the world. Each custom blanket he makes is machine-embroidered with the baby’s name, birthday, height, and weight. We’re not the only ones who think Dr. Bostrom’s unique personalized approach is something special. The news about Dr. Bostrom and his blankets has gone viral—from the Star Tribune, Fox 9 and several other TV news networks, to the American Academy of Family Physicians, a recent article by People magazine, and more. It all began when Dr. Bostrom wanted to add a personal touch to his practice—a way for patients to get to know him when he was the new doctor at Riverwood Healthcare Center. When he began making the blankets two years ago, he didn’t even know how to sew. “Back then, I knew how to stitch people, but not fabric!” he said. After a few sewing lessons from his sister-in-law, Dr. Bostrom felt comfortable to begin making the blankets. Initially, someone else did the machine embroidery, but he soon realized it wasn’t too difficult and now he does it all himself. Each blanket takes three to five hours to make and embroider. Since he lives up north on acres of forestland, Dr. Bostrom is also an outdoorsman who maintains trails on his wooded property. So when he was ready to upgrade to a new embroidery/sewing machine, his choice was easy. He picked a Husqvarna—the same company that makes his chainsaw. Click to learn more about the high-quality care in our obstetrics and family medicine department or our other medical specialties at Riverwood Healthcare Center.